This was originally published on this blog on December 23, 2008 by Kayte of This is Love Forever . 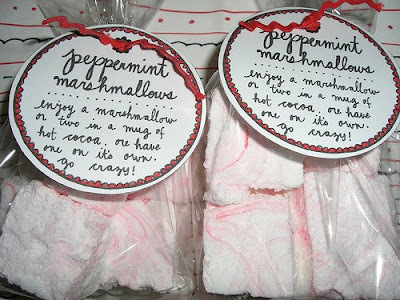 The peppermint marshmallows below are divine! They have become a New Year's tradition in my family. Though every family has their own traditions over the holidays, I think the best ones involve food! From the special potatoes my grandmother makes every Thanksgiving to the elaborate Victorian gingerbread houses my mom made when I was a kid, food reminds my of family, friends, holidays and joyful times. 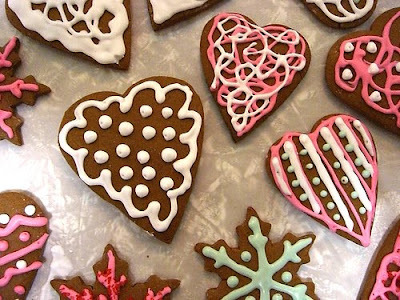 My mom and I almost always make gingerbread cookies (we like this recipe: from Martha of course!) for Christmas. I have spent many holidays in her kitchen rolling out dough, mixing up icing and decorating our work with glittering sprinkles and candies. My step-father, who hates to waste anything, noticed that an awful lot of dough was going to be tossed out and he made his very own holiday dessert with the gingerbread scraps: the Christmas Trout. I'm not sure if anyone ate the gingerbread fish but it was set out on the holiday table and we still laugh about it every year! Like my mom, I have always been drawn to baking: I get revved up and excited for holiday baking by September and usually like to take on some new baking challenge in addition to the tried and true favorites. I remember my freshman year of college, home on my holiday break, I made marzipan from scratch, then painted and shaped them into fruits. It was time consuming and tedious but worth the effort (not to mention the bragging rights!). I think that food is one of the best gifts: it is rewarding to make, to give and to receive! A couple of years ago I decided to make handmade marshmallows for family and friends. I packaged them up with a few gingerbread cookies and a tin of hot chocolate and it was really a great gift.People are still asking me to make more! Marshmallow making is a bit messy and I recommend a standing mixer as gripping a hand-held mixer on high for fifteen minutes is akin to some obscure form of torture. Also, the candy thermometer is your friend! Pay close attention! 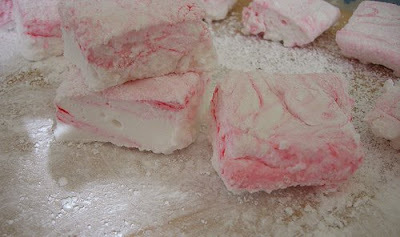 Here's a good peppermint marshmallow recipe. If you want to get really fancy, add a few drops of red food coloring to the marshmallows after you pour them into a pan and swirl the color with a knife. If you need even more holiday baking inspiration, check out Gourmet Magazine's website where they feature a favorite cookie from the past 68 years! I hope your holidays are filled with joy, restfulness and great eats!